The diminished scale is one of the most used symmetric scale in jazz music. It is an eight-note scale (octatonic) built by alternating whole and half steps. 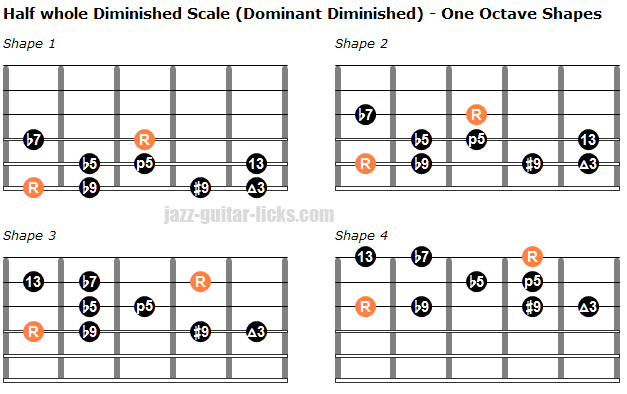 There are two modes depending on whether we start to play with the whole tone, in this case we will call it " fully diminished scale ", or with the half-tone, called " dominant diminished scale ". These modes are based on an equal division of the octave into four (minor thirds divisions). They are often confused yet it is very simple, one must be played over diminished seventh chords (dim7) and the other one over dominant seventh chords (7th). What Are The Two Modes of The Diminished Scale? The whole-half diminished scale also named "inverted diminished scale" or "fully diminished" is constructed using a repeat pattern of whole and half steps. It is used to play over dim7 chords. The half-whole diminished scale (the diminished scale) known as "dominant diminished scale" is constructed by repeating a pattern of half and whole steps. It is generally played over dominant 7 chords (7b9). What is The Whole-Half Diminished Scale? The whole half diminished scale also known as "Fully Diminished Scale" is an eight-tone scale, built by alternating whole steps and half steps, hence its name. It is used over diminished seventh chords (dim7). Because of its symmetry there are only three scales, C diminished scale, Db diminished scale and D diminished scale. In other words, C, Eb, Gb and A diminished scales contain the same notes. Db, E, G and Bb diminished scales are made up of the same notes. D , F, Ab and B diminished scales are also related. How To Play The Diminished Scale On Guitar? Here are four guitar fretboard diagrams representing the whole half diminished scale on the guitar neck within the space of one octave. If it is the first time that you play this scale, it's important to start with the root note (R) the orange note in the diagrams. Afterwards, you can try to play these shapes from another tone. Dont' hesitate to play the corresponding chord, in order to hear the harmony. Once you have memorized all the fingerings you must transpose them by moving the root on the desired note keeping the same intervals. As has been mentioned previously, you can move any diminished scale position up or down three frets and you will still find the same notes, this is the principle of symmetric scales. What's The Half-Whole Diminished Scale aka Dominant Diminished? The half-whole diminished scale or dominant diminished scale is symmetric. As its name implies, it is built by alternating half-steps and whole-steps. 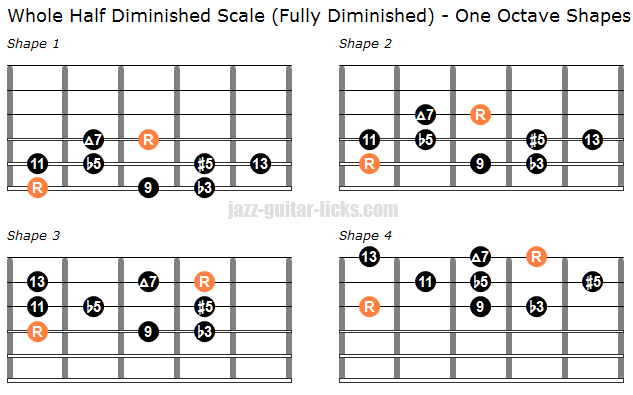 It is simply the opposite of the diminished scale (whole half) referred before in this web page. This scale is widely used by jazz musicians to solo over dominant 7th chords, particularly 7b9 chords. It can bring interesting tensions in your playing by highlighting the b9, #9 and #11. It sounds great on the V of a major or minor II-V-I progression or the VIb9 of a I-VI-II-V progression that can be found into rhythm changes or jazz-blues tunes. The C dominant diminished scale is made up of the same notes as the Eb, F# and A dominant diminished scales, as the C# contains the same notes as E, G and Bb. The D dominant diminished scale has the same notes as the F, Ab and B half-whole scale. That's the symmetry. As it is shown in the previous chart, these two modes have the same notes. How To Play The Dominant Diminished Scale On Guitar? Here are four half whole scale one octave guitar diagrams. The root note (R), the orange note, is the most important note of a scale. This is the main note that a scale is built from. Each scale has a root, when you learn scales it is very important to locate the root note. Once you have learned and memorized these guitar positions, try to transpose them in twelve keys by moving the root up or down keeping the same intervals. You can also create your jazz lines using patterns as it is explained before in this lesson. 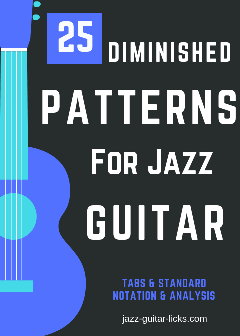 Here are the two other diminished guitar shapes that runs out two octaves in position. You can also play the corresponding chord namely 7b9. This is an effective way to relate scales and chords. As you can see in the example below, the obvious way is to play the G half whole diminished scale over G7b9 . Please note the D diminished arpeggio within the Half whole diminishde scale.